There are times that an album can be released and for some reason fall between the cracks. It could be an amazing album, featuring an accomplished performer, and produced by a top notch producer, and still not get the recognition it deserves. 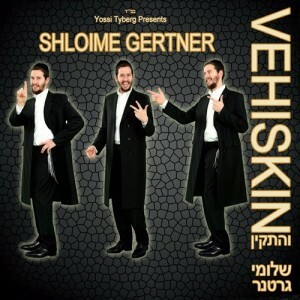 I have to say that Vehiskin, Shloime Gertner’s third album, is one of those albums. Produced by Yossi Tyberg and directed by Gershy Moskowitz, both of Teem productions, this is an album that I have thoroughly enjoyed since it was released Sukkos time. It has been one of my go to CDs in my car (yay I finally have a CD player in my car) and it is one of two recent releases that my (now) nine year old son recognizes right away and loves (yeah you can guess the other one). I also love how on the cover after every song, Shloime has a little note that gives a little insight or explanation of the song and why it’s on the album. I will be adding these little notes at the end of my assessment of each song. So why haven’t I written a review on it yet? That’s a good question that I really don’t have a good answer to, however I am out to right a wrong! So here we go! Chayim – Usually an album will not start out with a slower tempo song. Chayim, however, is a perfect choice in my opinion. This Rabbi Boruch Chait composition is a cross between a swing and oompah and speeds up a little bit over the course of the song. The arrangements by Moshe Laufer also build up as the song goes on. It is not the typical song you would hear on a modern sounding album nowadays, but in my opinion is a gem of a song. Shloime writes: “I had the zechus to join R’ Boruch Chait’s yeshiva for their Chanuka 2010 kumzits where they were singing this song. I immediately said to R’ Boruch that this song belongs on my next album. Thank you R’ Boruch for this song and for all your inspirational songs to which I grew up”. Kol Haolam – This disco horah composed and arranged by Moshe Laufer is another one of the newest style horahs, where the 2nd part is more upbeat than the 1st part. Not only are the words catchy, but the tune is too! Shloime writes: After this album was finalized for production, I received a call from Gershy Moskowitz telling me “Shloime! You must listen to this song.” What a great result! Thank you Moshe Laufer. Haposeach – This is a techno style song. The song itself, composed by Yitzy Waldner, is a nice song. As I have mentioned before, techno is not one of my preferred styles, however either this song is one of the exceptions or I am just warming to it. I think that Ilya Lishinsky does a nice job with the arrangements and programming. Shloime writes: Inspired by the holy words of the Yeshuos Moshe, The Viznitzer Rebbe Zatzal, who always said teshuva is achieved Mitoch Simcha. Yehi Chasdecha – This Yossi Green composition is the first true slow song on the album. A haunting and hartzige ballad, it is enhanced by Yossi’s inimitable background vocals and Moshe Laufer’s musical arrangements. Shloime writes: Over a rich bottle of wine in Seagate, at the home of the greatest composer, Yossi Green, we were going through his finest compositions. The words Yehi Chasdecha jumped out and Yossi shouted YES! YES! YES! B’chasdei Hashem, we’re done it again. Thank you Yossi Green. L’Chaim! Vehiskin – The title track of this album, Vehiskin is another feather in Yitzy Waldner’s cap. Not only is the composition beautiful, but his background vocals are impressive as well. This is a lebedik and fun song. I especially enjoy the 2 guitar solos at 2:35 and 3:32. I really have more to say about this song, but I think Shloime says it best: At a jamming session with Yitzy we felt inspired to use the words of Vehiskin Meoros to acknowledge all of Klal Yisroel who make sacrifices every day to Start the Day the Torah Way. Adon Olam – WOW! This song is just WOW! You know what I just said about Yitzy Waldner in the last song…well this song is an even more amazing song composed by him. This is not only a sweet and relaxing song to listen to, but the arrangements by Richard Niles are so much different than we are used to hearing on a Jewish music album. How refreshing! Shloime writes: One of the first Tefilos we learn as children is Adon Olam. When I first heard this beautiful melody of the phone with Yitzy, we instinctively knew it was perfect for Adon Olam. Ureh Vanim – Here is another classic Moshe Laufer composition. Add in his trademark horn filled arrangements and this is another enjoyable song on an album filled with them. Shloime writes: At every Yiddishe simcha you will hear great melodies with amazing intros. They will undoubtedly have been composed and arranged by Moshe Laufer. This song is no exception. Thank you Moshe Laufer. Shehashalom Shelo – This song highlights Shloime’s smooth and sweet voice. This Pinky Weber composition is another slow and hartzige song that is just so calming to listen to. Shloime writes: Pinky Weber, the acknowledged king of Badchonim, was in London to entertain at a Dunner family wedding. On his way to the wedding he popped in, and with great Siyata Dishmaya created this beautiful tune. May we all be zoche to…..v’yizku lir’os bonim u’vnei vonim (Amein)! Ben Chorin – This is a very lebedik and another amazing song. I first heard this song as part of a music video (http://www.youtube.com/watch?v=P2KTqOQIreQ) and immediately decided that my children would love watching it. The first time my son was in my car listening to this song, as soon as the song started he commented that this was the song on the video and really enjoyed listening to it. The song is composed by a friend of Shloime, Yanky Erlanger, and in my opinion, producers should be knocking down his door to see what other gems he composed! Shloime writes: Sitting in Kollel learning, I keep hearing a yunger man humming to himself the words of Pirkei Avos, “Ain lecho ben chorin”. Day after day we keep hearing this catchy tune and soon enough we’re all singing it and it becomes something of an anthem at the Kollel. Thank you, Yanky Erlanger. Mimkomo – What do you get when you combine one of my favorite composers, Baruch Levine and talented arranger (and while I haven’t heard much of his work, I absolutely love what I’ve heard) Richard Niles? You get Mimkomo! It’s a sweet, hartzige and just amazing song that is just so enjoyable to listen to. Shloime writes: One of the highlights of Shabbos Kodesh is saying Kesser in unison b’achdus in our shuls. The climax of Kesser is when we all declare the oneness of Hashem when we say “Shema Yisroel Hashem Elokeinu Hashem Echod” When Baruch Levine played me this song, my heart skipped a beat. Thank you R’ Boruch, for adding this gem to my album. Riboin – This song is composed and written by Lipa Schmelczer, and arranged by Bugsy and Simon. Since most of the lyrics are in Yiddish, I do not understand them and therefore really can’t comment on the song. Shloime however, had a lot to write about this song: This is a song I’ve had for so many years, but struggled to find the ideal time to release it. As technologies advance apace, we ask Hashem to give us the strength to rise to the challenges of these modern times. Thank you LIPA for allowing me to hold onto this precious song. It is a true gift! In conclusion, I am not sure why anyone doesn’t already own this album (unless you say you were really waiting for my review, then we’ll excuse it this time). However, if you for some strange reason don’t already own it, you can buy it on Mostly Music http://www.mostlymusic.com/vehiskin.html or anywhere good Jewish music is sold! No words shloimy I was always your fan if u make a nice album or not your voice and heart is something no one can take away from you!! !